Handling Time : Approx 10 business days. There is no better gift than a cradle for your new member in the family. And if that is a Handcrafted Unique Cradle offered by Aarsun Woods, this adds to the joyous moment. 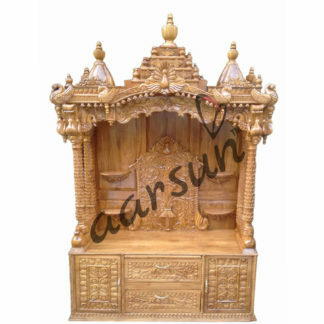 Aarsun Handmade wooden Cradle (Palna) is made in fine quality wood and fine carving and finishing. The Wooden Cradle is best suitable for home and for your babies. It is a fantastic gift for new members in the family. Aarsun Woods Handcrafted Cradle (Palna) is divided in two parts: first is the cart inside where the baby can playfully lay down, and the second is the Pillars and Frame adjacent where the cart can be attached and the swinging action can be performed easily. The cart is hung between the pillars with the help of sturdy chain which is attached to the sides of the cart from four ends and from the top bar of the pillar frame. 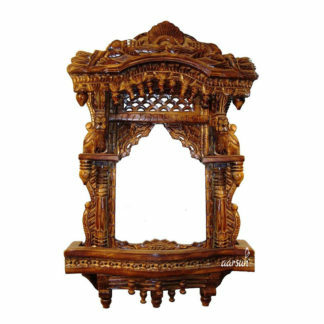 It is the wood and the carvings over it that makes the Cradle a piece-of-art. You can place cushions as per your need and then use it for your babies. It also work as a swing for the babies & is very comfortable to use. The Wooden Baby Cradle is dispatched in dis-assembled state (knock-down-manner) and can be assembled in minutes without any assistance of any carpenters. For instructions video, click on the link for our YouTube Channel . Made from Premium Quality Sheesham (Indian Rosewood) with Teak plywood at the base*. The unit can be customized as per your requirement. Sheesham Wood is the most famous wood used by the artisans for making furniture or any type of wooden item especially for home or office purpose. It is the best timber wood which is used in India especially for handicrafts purpose. *Please note that the base of the unit is made in teak plywood to stabilize the structure and lessen the overall weight of the unit. Are you looking for a different material, design in Wooden Palna, we are recommended you to have a look at Sheesham Wooden Palna / Cradle. Wood and finish is as shown on web site,,,,,, I purchased directly from aursunswood.com ….but got disappointed due late delivery,,, other wise it’s worth every penny….. In Bangalore it may cost 40000++++. If we order for such an design and finish made in sheesham wood. cradle is very nice.. i had taken it directly from aarsunwoods as we wanted somewhat bigger size… finishing is very good and quality is up to mark.. five stars for it! First of all , the cradle which i received was exactly as same as the sample picture given. The wood quality is really good. The craftsmanship is stupendous, i had no idea that they will go through so much detailings on the wood for that price. Assembling the cradle was easier as they sent me a sample video.Packing was top notch. Customer support was also really good. If you’re looking for a good cradle at the best price hands down to aarsun woods.